Another week, another impressive victory for Laura Muir. Yet for once yesterday, the endeavours of the newly-crowned European 1,500m champion did not go precisely to plan at the Muller Grand Prix in Birmingham. Her tilt at Kelly Holmes’ British best at 1000m came up well short. Not that it will trouble her unduly. With a maiden major outdoor title tucked away for keeps from her trip to Berlin, the Scot has plenty still to savour. Winning in 2:33.92, she will now turn her attention to the conclusion of her summer season at the Diamond League final in Brussels later this month. And then beyond to greater prizes in 2019. Muir’s fellow Berlin gold medallist, Dina Asher-Smith, was held off in the women’s 200 metres by Shaunae Miller-Uibo of the Bahamas in 22.15 secs. However, the much-anticipated men’s 100m lived up to its hype with two angles of a photo finish required to determine that the World Indoor champion, Christian Coleman (USA), had overcome Great Britain’s Reece Prescod, even though both were timed at 9.94. It moved the Londoner up to fourth in the UK’s all-time rankings but it could have been even better with a less laboured start. “As a treat for myself after the Europeans, I got a projector to use in my house so I have a big screen to do video analysis,” Prescod revealed. 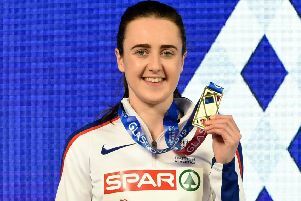 Scotland’s Eilidh Doyle claimed fourth place in the 400m hurdles in 56.61 secs but in the Emsley Carr Mile, Scottish duo Neil Gourley and Chris O’Hare came eighth and 12th as Australia’s Stewart McSweyn took a shock win. Jake Wightman was seventh in the 800m in 1:45.00 with his assault on Tom McKean’s Scottish record almost two seconds short. And although his fellow Berlin medallist Eilish McColgan took fourth in the 3000m, she confessed to a lack of raw energy after coming down from an immense high.